Tour of Lourdes Sanctuary Includes: Our private tours of Lourdes include English or Spanish-speaking tour guide and taxes. 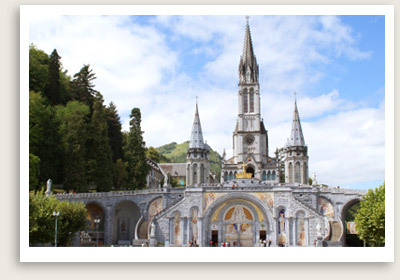 This privately guided half day tour of The Lourdes Sanctuary takes you on a tour through The Sanctuary and Grotto of Massbielle, the site of Bernadette’s visions. Visit the outside baths where pilgrims bathed in its supposedly healing waters. You will also visit the three churches that were built on site, one on top of the other. Experience the Candle Burners and Water Taps with your friendly and knowledgeable guide. After your tour you can enjoy some free time in the sanctuary for personal discovery or enjoy a leisurely lunch in the beautiful town of Lourdes.